Right now scores of surf fans that bought tickets to the inaugural Surf Ranch Pro are pouring into the WSL’s facility in Lemoore. It’s 68 degrees now, with a forecast calling for triple digits in the early afternoon. Fans are catching the action late. There’s already been a single day of competition that was only available to watch via livestream, and due to the novel structure of this contest, there’s no heat analyzer to look back on your favorite surfers’ waves. Just the highlight video above and scores (click here for the men and here for the women). Today 19 men and 9 women will surf their two runs in reverse order of how they’re currently ranked on tour – Steph Gilmore and Filipe Toledo will close out each. And going into today’s action, Kelly Slater predictably holds the top slot on the men’s side (the wave has his name on it, after all), and Coco Ho is holding it down for the women. 1. Judges aren’t throwing out 10s willy-nilly. Hell, scores in the excellent range are few and far between. Consider this: not a single wave got slapped with anything higher than an 8 – Sebastian Zietz’s 8.67 and Coco Ho’s 8.5 were the highest scoring waves of the day, respectively. At that, both were solid waves start to finish. And what does that say? The judges aren’t going to award a one-maneuver wave. Hell, Pat Gudauskas pulled a rodeo flip at the end of his top scoring left for a total of a 6.97. No, the judges want to see multiple hail marys on a single wave. And the prospect of doing that on one of the just four waves each surfer gets must be nerve-wracking, which brings me to the next observation. 2. Nearly every surfer in their post heat interview talks about the nerves. The crowds on Thursday were minimal. Mainly because, as I said, the place wasn’t open to the public yet. And still, the prospect of being the only surfer in the pool, the need to perform; it was enough for endless comments in post-heat interviews about the nerves that come with a contest format like this. Add on top of that the crowds of fans that bought tickets, and the stage fright factor has to be huge. 3. Joel Parko’s cheater’s five tube was a 10 in our hearts. Again, the highest scoring waves of the day were the ones where surfers took off as early as possible to maximize their number of turns, committed to them, and got deepest in the barrel. Some had flair, but others were indistinguishable from the pack. You’d be forgiven if you found yourself asking, “Was that Frederico Morais or Joan Duru?” In the final barrel section of one of his rights, though, Joel Parkinson eschewed convention and planted a cheater five in the microtube with characteristic style and grace. He wasn’t rewarded too handsomely for his creativity, but hell we loved it. 4. Head-to-head thrills no more. As we reported previously, the new contest format of the Surf Ranch Pro strips away head-to-head heats entirely. No more mind games, priority rules, or showdowns. In some ways this is precisely where we were headed every time the judging panel supposedly robbed a surfer of a heat win causing an internet firestorm. This format doesn’t remove the judges, but it removes nearly every bit of luck associated with winning a contest in the ocean. Every surfer gets the same number of the same exact wave and it’s up to them to do what they want with it. It’s as close to objective scoring as surfing has come, which might explain why some fans are so put off by it. 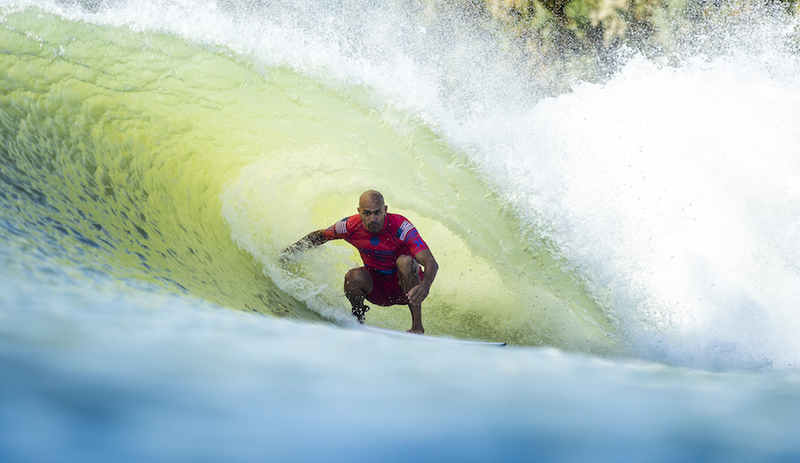 As Day 2 begins, a few questions linger, including: will anyone be able to unseat Kelly Slater from the throne he built? Watch the action live here.